An election that was entirely avoidable has cost Unionism the majority at Stormont for the first time in the history of Northern Ireland. All the causes of the current election will be debated and discussed over the coming days and weeks, but for Unionism there is a more salient point. The real cause of the current pain for Unionism stems from the Belfast and St Andrews Agreements. It was then that pro-Agreement Unionists agreed to allowing Republicanism into the heart of Government- when the republican mandate wouldn’t have bestowed such luxuries upon them in any normal democratic system. Mandatory coalition twisted and turned democracy on its it head; it ensured that a minority- from whichever side- would always have a veto over the majority. It ensured, as we have seen recently, that the institutions rested on a mutually accessible destruct button. Sinn Fein- who in any normal democracy could never have pulled the house down availed of their veto. There was a real grassroots energy about the Sinn Fein campaign. I detected the same ‘buzz’ around the Alliance party and Greens. Their activists were energised. Their elected representatives were confident and their respective electorates clearly bought into their vision. There wasn’t that buzz around Unionism. It felt often like a pointless campaign, being fought out of necessity rather than a desire to achieve. We saw a passive Unionism and a passive Unionist electorate. It was a defensive campaign. As a Unionist I can only hope that the result serves to awaken Unionism and energise a generation of political activists. Whilst the Sinn Fein leadership managed to energise Nationalist young people and give them a vision of which to take ownership, the DUP campaign offered nothing attractive to the younger Unionist generation. On polling day I went around my football team at training and asked how many voted. Only 5 out of 17 did so. The rest were simply ambivalent. On Saturday I asked the same people how they felt about the result. They were outraged and wanted to find a way to ‘fix it’. There was a natural hurt amongst Unionist people who aren’t normally political, and many of whom only 2 days earlier hadn’t felt passionate enough to vote. Perhaps if there is any positive for Unionism from the events of the election, it is that it has awakened a desire to ‘do something’. But for those Unionists who now want to engage or re-engage in politics, there must be a vision. There must be a narrative in which people people can believe. There must be a ‘buzz’. That’s the challenge for Unionism moving forward. In the meantime whichever way Unionism turns there is going to be pain. The mood music suggests the DUP may be amenable to Arlene Foster stepping aside, if she chooses to do so of her own volition. If that transpires we would have Arlene Foster stepping aside for a period of time and a public inquiry into RHI. Unionists would then have to seriously ask why Arlene Foster sacrificed so much only to eventually do what she could have done at the very start. It is clear in my mind that Stormont, in its current form, would have to be run on a constant stream of concessions or it won’t run at all. Sinn Fein will demand much in order for their participation, and the DUP will be faced with a choice between clinging to power and feeding the Sinn Fein concessions meter to do so, or pulling the plug. Direct rule is not the most unattractive option. It appears we have the most right wing Government since Margret Thatcher. If ever there was going to be direct rule, for Unionism this is the best time for it. Direct rule will bring some painful legislation with it, not least on social issues; much of which traditional Unionism would be strongly opposed. There is going to have to be a price paid for the monumental tactical error of the DUP. That may be it. 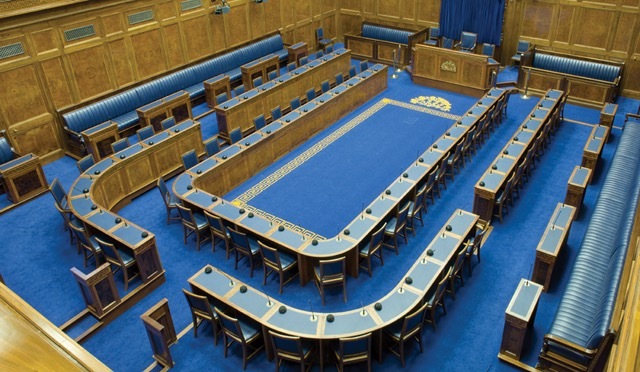 There are hard questions ahead for Unionism, and difficult decisions will need to be taken. There is one plus side to the contrived mutual veto over Stormont. It’s available to Unionism as well. All is fair in love and war, and if Unionism has to exercise that veto in order to force direct rule, or fresh elections, then so be it. The incoherent, ungrammatical ramblings of an imbecile! That’s two minutes of my life lost forever. Total waffle that denies reality & offers no transparent or constructive solutions. Some reality: The DUP is not Unionism nor does the Party represent the majority of the electorate (let alone the population). The latest election result demonstrates a clear mandate for pro-GFA parties (with others) to get stuck in at resolving issues & cooperatively deliver stable good Government for all citizens here. Some solutions: Stop denying rights that are valued & in place in Britain (and elsewhere), Stop dehumanising people in ways that wouldn’t be tolerated in Britain (and elsewhere). Stop assuming that any vote is guaranteed – actual political delivery is relevant & important to the majority of the electorate. Stop dismissing qualified & professional advice regarding the real implication of BREXIT to business here. Back to earth with a bump. Didn’t Maggie sign the AIA bringing Dublin in for the first time ?